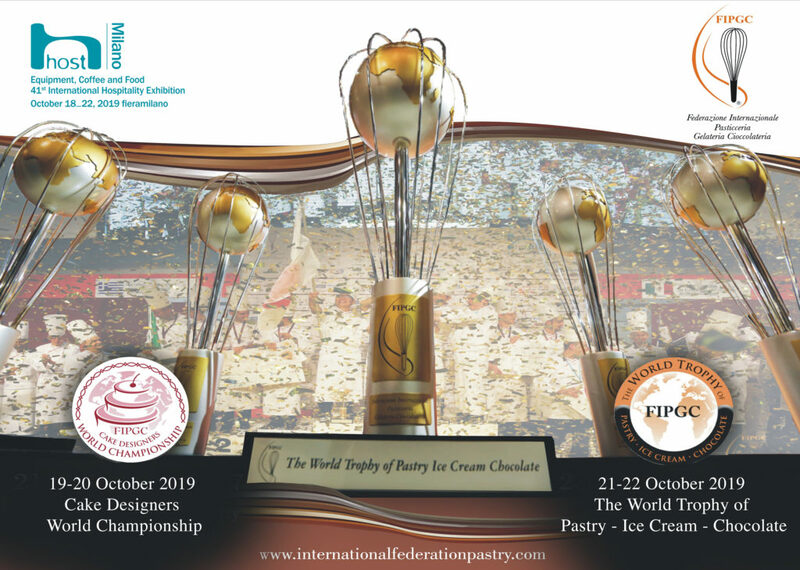 Participation in the World Championship of Pastry Ice Cream and Chocolate FIPGC, organized by the Pastry, Ice Cream and Chocolate Federation, is open to every country in the world. The theme of the World Championship FIPGC 2019 for each team will be “National Art and Tradition” (refering to its home country). Pastillage Sculpture and Single-Portion Ice Cream. The Competitors must present an artistic chocolate piece with a maximum height of 180 cm, using all the chocolate techniques, without using any internal support. The artistic chocolate piece can be brought already done (for the structure and for the casted and printed structure –bearing elements). The flowers, lightening, any characters must be done live. 30 Pralines with the use of moulds. The weight of each praline must be a maximum of 12 g.
The competing teams must present an artistic sugar piece (without pastillage and airbrushing) with a maximum height of 180 cm, the artistic sugar piece can be brought already done (for the structure and for the casted and printed structure –bearing elements). The flowers, lightening, any characters must be done live. 4 cakes diameter max 18 cm, which must be the same shape and flavour. (3 cakes for the jury tasting, 1 cake which has to be positioned on the artistic piece). All bases (wafer, sponge, shortbread, biscuit, meringue, crispy etc.,) must be brought, already cooked by the competing team. Alternatively, the teams that take position in the workstations the day before the competition may prepare their bases from 4.30 to 6.00 pm. Any glaze to cover the cakes can be brought already ready. Equipment such as sugar lamps and other small personal utensils as knives, spatulas, etc., must be brought by the competing team. The support base for the artistic Sugar piece and for the Modern Cake which will be positioned on it must be brought by the competing team. The plates for the cake to be presented “visually” to the Jury before tasting and the plates to be presented to the jury for tasting, will be provided by the organization. The competing teams must present a pastillage sculpture with a maximum height of 180 cm, it can be prepared beforehand and assembled live. It must be mounted and airbrushed (if there is any airbrushing) on the spot. The Teams must present 1 type of single-portion ice cream (20 pieces in total) to be presented to the tasting jury. The single-portion ice cream must be presented as a dessert on a plate (the plate may also contain a sauce to match). All bases (wafer, sponge, shortbread, biscuit, meringue, crispy etc.) must be brought, already baked by the competing team. Alternatively, the teams that take position in the workstations the day before the competition may prepare bases from 4.30 to 6.00 pm. The support base for the artistic pastillage piece and for the single-portion ice cream, which will be positioned on it, must be brought by the competing team; the single-portion ice cream, positioned on the pastillage piece must be visibly similar to the single-portions to be tasted, but may be made with ingredients that withstand room temperature. The plates for the single-portions to be presented “visually” to the Jury before the tasting and the plates to be presented to the international jury for tasting, will be provided by the organization.